Certain archaeological wonders have left me in awe and amazement with their splendor. I first visited Mahabalipuram (A place of National Heritage) when I was just three years old. I still remember climbing on top of the big elephant carving. For the next five years I was left to believe that it was indeed a real elephant. Let me get into thetopic.Last year I enrolled myself in a carving competition because of my love for carving. After getting enrolled into the competition, I was told that the name of the competition was “vegetable carving”. I came to know that the competition would last for an hour. I was also told that equipments and objects for carving would be given only inside the competition hall. When I entered the competition hall , I realized that there were 22 other competitors vying for the top spot. I also realized that I was the only species from the male community inside the hall. That made me go pink. Suddenly one lady emerged from behind the door and announced the rules for the competition. I was given a bag and I found some vegetables inside the bag. The lady also placed a big container that had a consortium of many vegetables, in front of us. She also gave each one of us a fork, a spoon, a box of tooth pick and a knife. I did not know what I had to do with those. Just before the competition started she announced the theme of the competition. The theme was “Man made wonder”. I still did not have an idea about the competition. Soon she rang a bell and said in a loud tone, “Your time starts now”. Immediately the 22 women folk around me got into the act. They were taking vegetables from their respective bags and cutting and slicing the vegetables. Some even ran to the front and picked some vegetables from the big container that was kept in front of us. I sheepishly looked inside the bag that was given to me. I found four brinjals, a few ladies fingers and half a kilogram of tomatoes. I picked one tomato and cut it into half and started eating it. While eating I turned around and saw the neighboring girl creating a house with the vegetables provided to her. I asked her what she was up to! She said that she was carving a house. She was also kind enough to explain me the rules of the competition. I looked around and found a few castles, bridges, dams. One girl was even making a train from the vegetables. I started thinking what to do and by the time I came to a decision, I had already finished eating the tomatoes provided to me. I was only left with the brinjal and the ladies fingers. I found it better than the fingers of the lady sitting behind me, cos she was constantly picking her nose. Finally Renu’s face flashed in front of my mind. Immediately I decided that I would build Taj Mahal. I ran to the container and found a few vegetables. I took them back to my seat and started building my own Taj Mahal. I started crafting and carving the vegetables with deft touches. I also found a candle stick in the container. I broke it into pieces and lit it and gave a glowing appearance to the Taj and finally I was happy with my wonderful creation. One hour was over and every one stopped carving. The judges started inspecting. Just when they reached my table, my Taj Mahal fell down that made the judges smile at me. I smiled back at them. I did not get any prize in the event. But I was given the MAN of the competition award. I dedicate this post to Renu. This is the Taj Mahal I built for her. it does not look like that? lolz!!! tats got to be the most - umm - organic and healthy building ever!!! 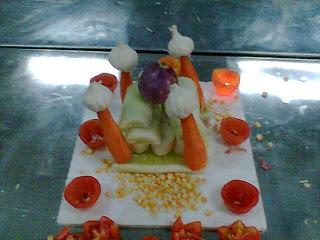 a vege Taj Mahal...now Im crying even more...cos Men these days r so lazy LOL! wow. is that taj or is THAT the taj now? =P hehehehe. ha ha! finally u've played the role of Shahjahan too? yes i ate the carrots after the competition..
shahjahan cut the thumb of the masons.. i heard.. is that so? Reminds me of my cookery competition at school. Had a friend for company though, the ratio was more skewed against us. After sometime, we couldn't withstand the embarrassment and deserted our stall. Good old days where we would do anything to skive classes! !